The incident took place at around 2.45pm on Thursday in Highholm Street, Port Glasgow. Two people are in hospital after an explosion at a block of flats in Inverclyde. 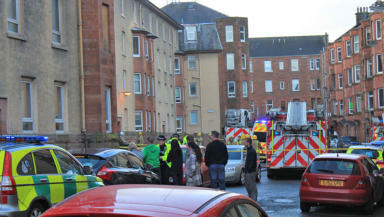 A man and a woman have been taken to the Inverclyde Royal Hospital. The details of their condition are not yet known but their injuries are not thought to be life-threatening. A spokesman for Police Scotland said two blocks either side of the address were evacuated due to the extent of the damage caused. The emergency services and Scottish Gas are still at the scene investigating the circumstances surrounding the explosion. Alternative accommodation has been arranged for those affected by the evacuation, the police spokesman added.